Where Were the First and Second Temples Located? Listen to the 1993 Temple Mount Conference Lectures by Dr. Asher Kaufman, Dr. Dan Bahat, Tuvia Sagiv, Rabbi Chaim Richman, Gershon Salomon, and others. 1995 Temple Mount Conference Lectures by Dr. Chuck Missler are here. 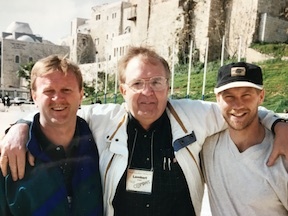 Tuvia Sagiv and the Third Temple Location problem is the subject of an article "What if This Isn't the Western Wall," in the November 23, 1998 issue of The Jerusalem Report, available on Internet. Papers by Tuvia Sagiv are ©1996 Tuvia Sagiv, 27, Elkachi Street, Ramat Aviv, Tel Aviv, Israel; Phone (3) - 6437066, Fax: (3) - 6437067. Israel Peace with Iran and Neighbors is an open letter by William Mohlenhoff regarding the Temple Mount and Peace Solutions. It appears obvious that the key to peace is co-existence on the Temple Mount, without coercion of one monotheistic faith by another. The author calls for a ceasing of all belligerent Jihad tactics from the Moslems, Jewish dominance, or preaching by Christians. We can show only that we have the tolerance of other beliefs and will observe mutual Temple Mount access by all three faiths in specific areas that conform to the needs of each faith. The author writes with emphasis and points to Israel's history and specific Biblical prophecy. 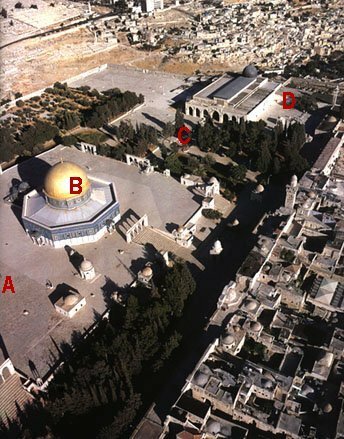 Some authorities believe the Ark is located under the Temple Mount. This web site was developed by Jim Milligan, Lambert Dolphin, and Michael Kollen in April 1996. Updated on June 17, 2013, May 26, 2018, August 15, 2018, October 31, 2018. January 3, 2019. Hosted by Blue Letter Bible. "Google Translate" this website into Hebrew תרגום מאנגלית לעברית מאתר על ידי גוגל here.